Lent starts tomorrow on Wednesday, Feb. 13 - It's Ash Wednesday on the church calendar. It's a season of reflection, as we move towards Holy Week and Easter. Some years during this time, I "give up" something as part of my Lenten fast. Last year, to the delight of the tweens I work with, I gave up Starbucks. It was a long Lent 2012. This year, I've decided to "add something" - I'm going to pick up the Lent Photo A Day challenge, sponsored by ReThink Church, a ministry of the United Methodist Church. I'm still trying to figure out what I'm going to snap tomorrow. 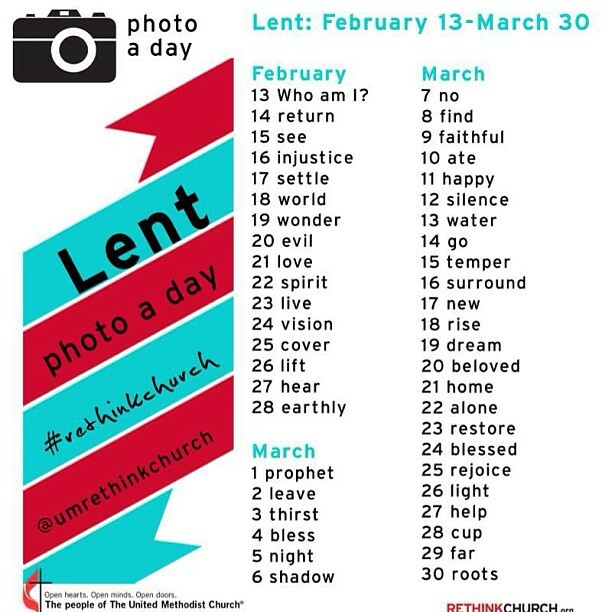 Basically, I'm taking my "photo a day" (I've snapped a photo a day for the past 14 months) and giving it a Lenten twist. "You don't have to be a great photographer. This project is hopefully more about the practice of paying attention and being intentional, than it is being the best photographer [though we encourage you to get creative!]."